BECCA is the queen of multitasking , 4 bags in 1! A messenger bag that fits a laptop perfectly; a handbag with two outside pockets for phone or sunglasses; flip the top for another handbag look; and let’s not forget the backpack. The best go-everywhere, wear-with- anything bag, the BECCA is a must-have for every woman. Read why AMBLE & PEARL thinks our BECCA is “The Perfect Convertible Travel Bag” Read how HALFSTACK Magazine believes BECCA "…can transform as well as Optimus Prime." DENISE does it all. Deceptively small and lightweight but has three compartments and a smaller zipper pocket. Designed to fit your wallet, sunglasses, phone, keys and lip gloss. The perfect bag for dancing, walking dogs, running after kids, shopping, hiking, etc. Hands free? Wear it on the waist. Fancy event? Clutch it up. Or just wear it as a handbag on your shoulder. The adjustable strap and clips make it as versatile as you are. 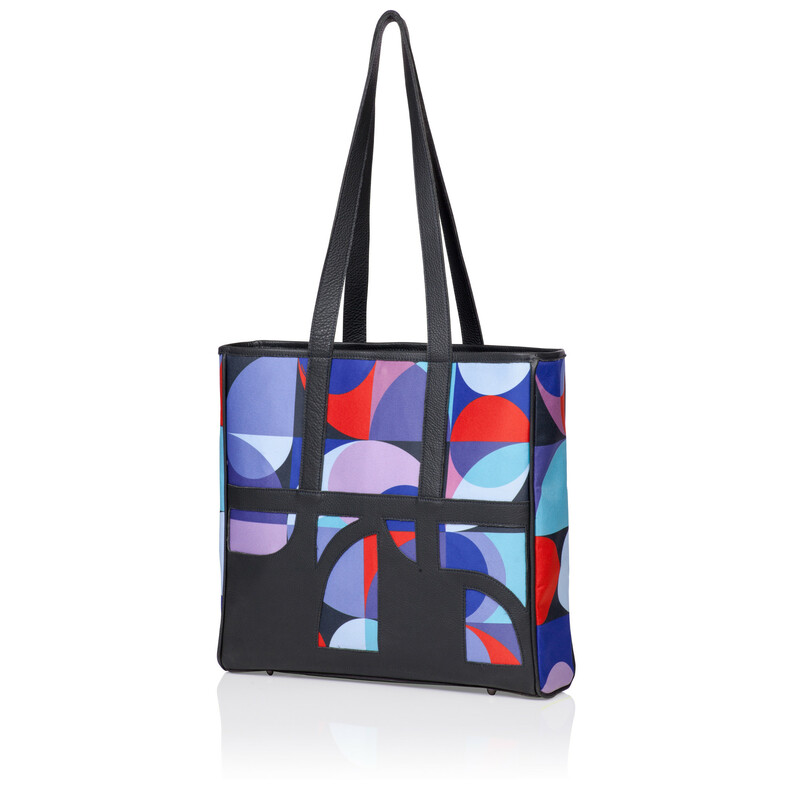 KATH is a modern tote that carries it all with ease. Two water bottles? No problem. Always loosing your keys? Not anymore. A laptop and gym clothes? Gimme more. The soft leather and light weight feels amazing on your arm. 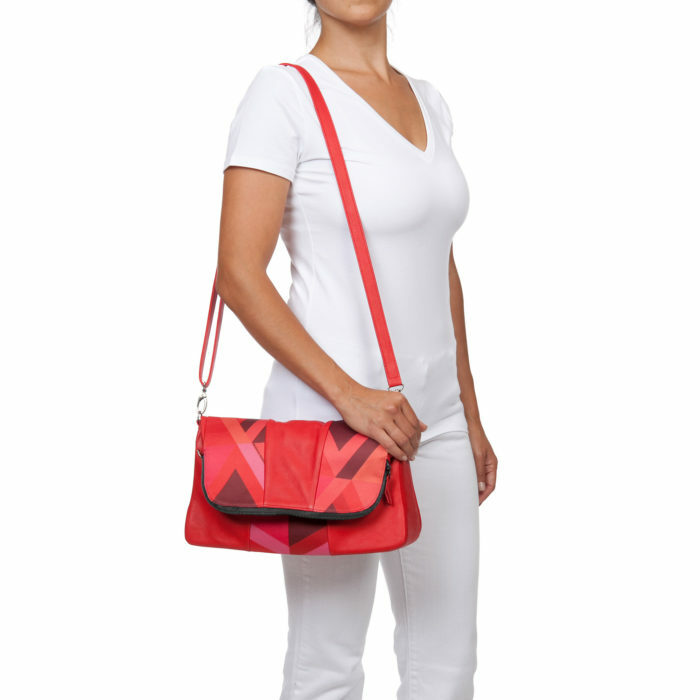 KATH is a funky yet practical bag that you can load up and go anywhere in style. 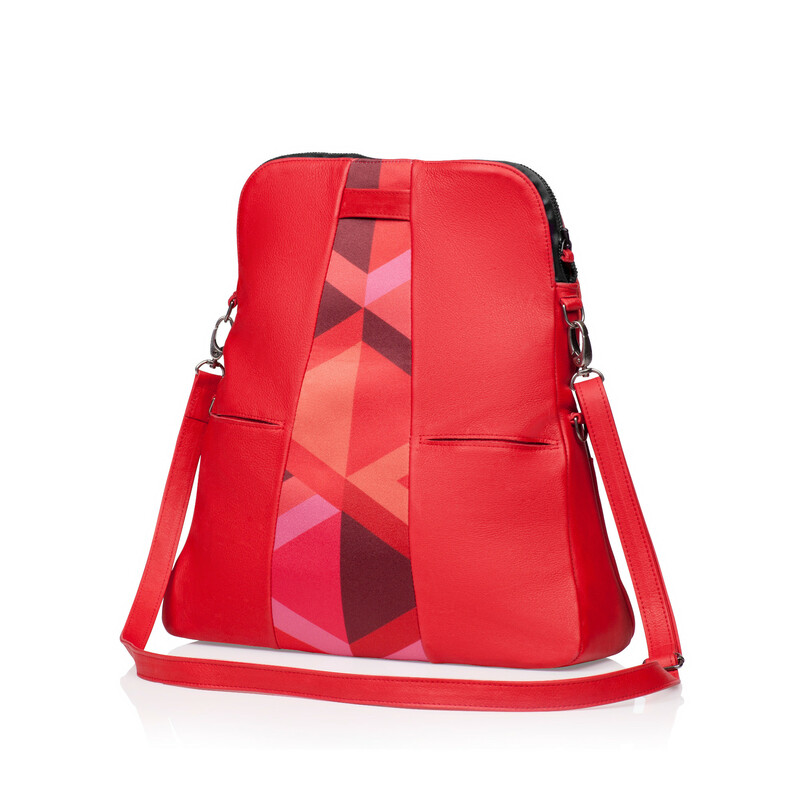 HANNAH is cute and packs a punch with bright graphic patterns and colorful leather accents. Fancy event? Clutch it up. Around town? Go hands free with the gunmetal chain. The colors complement any wardrobe. Jeans, gowns, leggings, HANNAH can be worn anywhere with anything. HEATHER is classic yet modern. She makes a big statement, but weighs almost nothing. Deceptively spacious, HEATHER fits snuggly against your body but is packed with lots of features: attached key ring clip, multiple accessory pockets and four gunmetal feet. 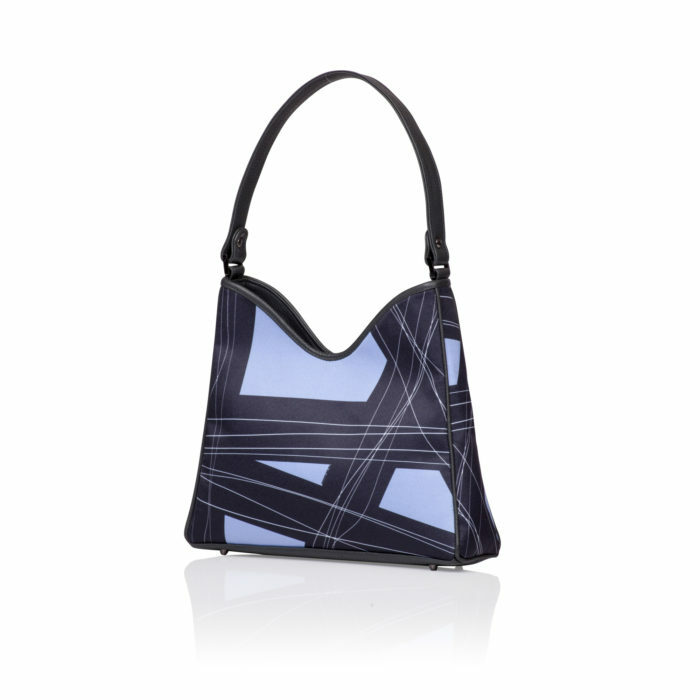 Beautifully proportioned, HEATHER is the perfect handbag to brighten up your day. Read why FASHION MANIAC thinks JoJo Handbags are "multi-functional, lightweight, practical purses that are outfitted with convenient pockets, luxurious materials and high-end hardware”. Pick your power! 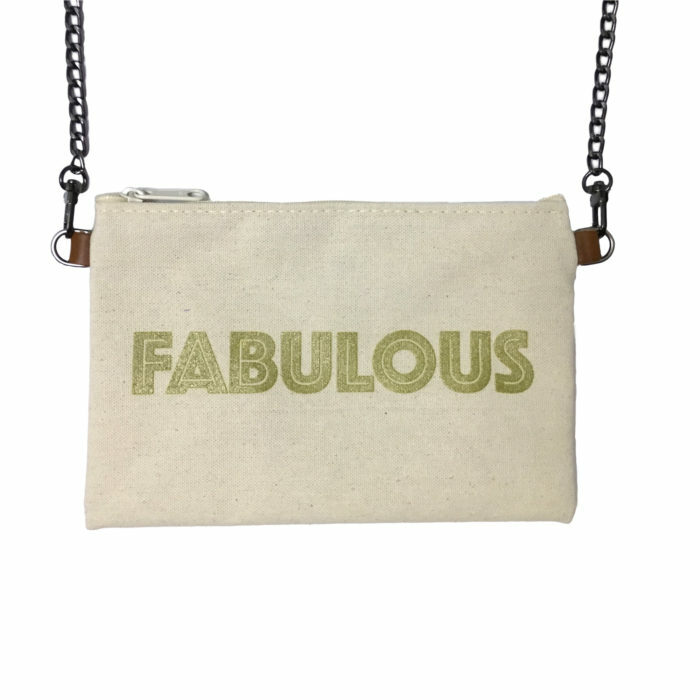 Sassy canvas purses with metallic fabulous text. Those words were spoken by JoJo Handbags’ founder and designer, Joanna Dubbeldam, and they serve as a roadmap for the company. 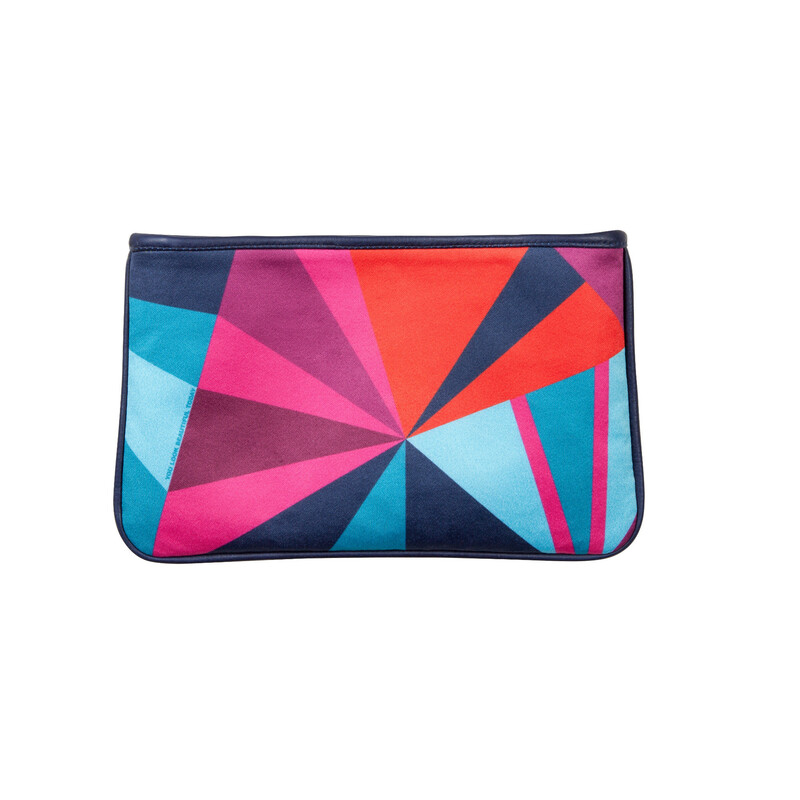 JoJo Handbags manufactures unique, stylish handbags, tote bags, waist bags, crossbody bags, clutches, and backpacks that reflect the needs and values of the modern woman. Elegant, practical, versatile, and multi-functional, JoJo Handbags are a whole new category of fashionable handbags. To inspire women to shop local, JoJo Handbags are produced ethically in California and offer designer styles without the steep price tag. JoJo Handbags’ unique line of practical bags can be identified anywhere by their vibrant colors, bold graphics, and thoughtful details. 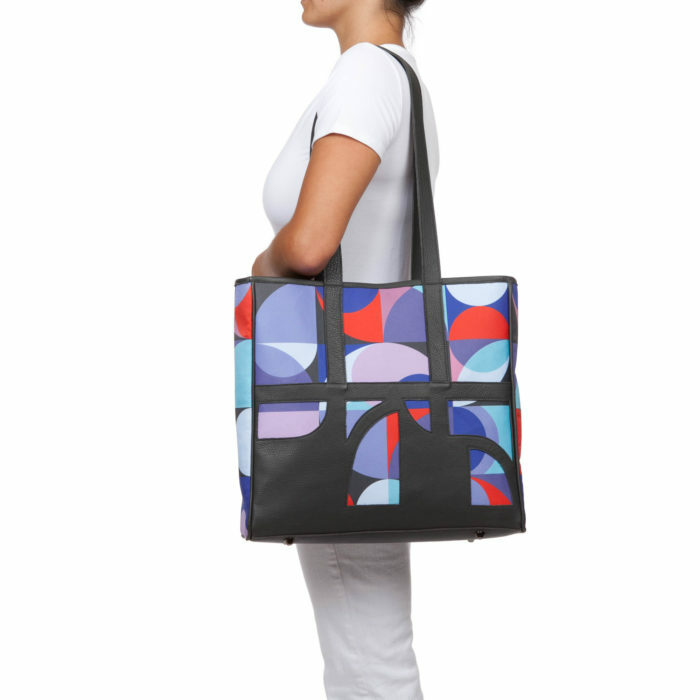 By layering high quality leather over fabrics printed with colors and fun yet sophisticated graphics, JoJo Handbags’ stylish backpacks, totes, clutches, waist bags, crossbody bags, and handbags are a confident finishing touch to any outfit. 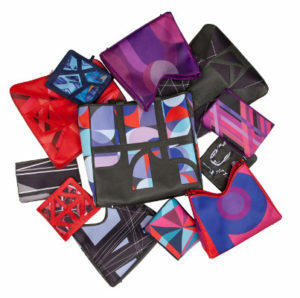 The mark of a quality handbag is in the details: the bold prints and eye-catching colors may stand out, but JoJo Handbags’ lush purple lining, custom zippers, luxurious die cut leather, and gunmetal hardware ensure they can reliably keep up with customers’ fast-paced and versatile lives. The fabric even carries small inspirational and positive printed messages to make women feel great. Handbags crafted from a combination of leather and fabric are more rare, primarily due to the fact that leathersmiths and seamsters practice their craft on different machines. Combining the two materials is a time- and labor-intensive process, but one that results in truly unique pieces of wearable art that are well worth the effort. The team at JoJo Handbags understands that substance matters every bit as much as style. That’s why each bag is crafted to be a super lightweight, practical, and multifunctional companion to your busy life: key ring clips, built-in water bottle holders, and leather-lined pockets let you keep all of life’s necessities within easy reach. Each JoJo Handbag serves numerous purposes and suits a variety of occasions. The fashionable BECCA backpacks transform quickly to a handbag and messenger bag; the DENISE waist bag converts to a crossbody bag and into an elegant clutch; HANNA converts from a sleek clutch to a fun crossbody bag. JoJo Handbags are designed to mirror the versatile women who carry them. JoJo Handbags’ manufacturing process is anchored by commitments to ethical practices and quality craftsmanship. The distinctive bags are crafted by artisans in California to reflect the owner’s efforts to support the domestic economy. The stylish handbags are assembled using the finest materials, from premium soft leather to gunmetal and brushed nickel hardware to luxurious yet washable fabric accents. JoJo Handbags believes that high-quality components deserve to be treated with care and respect, which is why they employ seasoned leathersmiths and seamsters. As a fourth-generation designer, Joanna Dubbeldam’s appreciation for clean lines and modern design is ‘in the blood.’ Born in Toronto, Canada and residing in San Diego, Joanna is a successful entrepreneur, designer, and art enthusiast. As the Principal of Adobe Liveable Art, JoJo Handbags’ founder and designer has indulged her passion for fabric for years. Adobe designs and manufactures sleek, modern throw pillows for leading international hotel chains including Aloft Hotels, W Hotels, and Sheraton Four Points Hotels. Today, Adobe Liveable Art products can be found in establishments around the world. With a keen business acumen and experienced artistic eye, Joanna was able to identify a void in the fashion handbag market. By specializing in interesting design integrations of leather and fabric, JoJo Handbags occupies a special handbag niche embodied by unique, interesting, colorful, lightweight, and practical handbags that have great versatility. In launching JoJo Handbags, Joanna has worked diligently to craft handbag designs that appeal to the needs of the modern woman. Passion for art in all its forms is central to JoJo Handbags’ design. From the age of 13, Joanna Dubbeldam has collected works of art, and today her extensive collection includes pieces from contemporary galleries around the world. Joanna’s love of creating and studying art was refined during her Fine Arts and Art History degree at the University of Toronto. 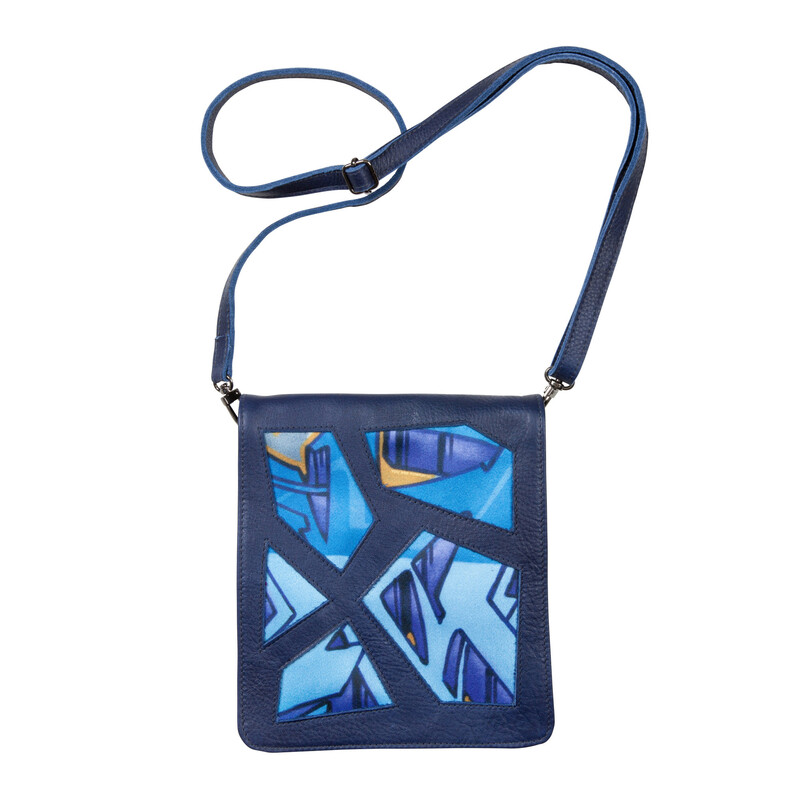 JoJo Handbags’ distinctive modern designs are influenced by works from Klimt, Rothco, Mondrein, Lichtenstein, and Kandinsky. Scandinavian, Japanese, and Pucci’s textile design, as well as geometric shapes, nature, photography, architecture, typography, and even graffiti have all influenced JoJo Handbags’ modern look. The DENISE collection is explicitly inspired by the spontaneous, sometimes chaotic, and ultimately beautiful nature of graffiti art. This combination of refined materials, interesting layering, expert craftsmanship, and modern art-inspired design allows JoJo Handbags to truly standout from competitors. JoJo Handbags is supporter of the 100 Women Charitable Foundation, a public charity made up of women committed to supporting and changing the lives of those in need in the San Francisco Bay Area, and Women for Women International, a nonprofit humanitarian organization that provides practical and moral support to women survivors of war. JoJo Handbags also supports local women’s shelters. JoJo Handbags’ commitment to charitable causes that support women underscores their deeply held belief in and commitment to female empowerment and corporate responsibility. KATH is a lightweight beauty that transforms from classic office bag to funky beach tote in seconds. It has room to carry two water bottles, towels, sunscreen, and summer reads, or can go practical with space for one’s laptop, work files, and snacks. This lightweight, stylish tote bag features soft genuine leather that is cut to complement the bold graphic pattern beneath. It stands confidently on four sturdy gunmetal feet, and contains duo water bottle pockets, a pair of open leather-lined accessory pockets, rich purple satin lining, and a large zipper pocket with a key ring clip. KATH is manufactured, like all JoJo Handbags, in sunny California. Weighing less than an egg, HEATHER is a stylish handbag available in three vibrant colors: HEATHER coral, HEATHER gray, and HEATHER purple. 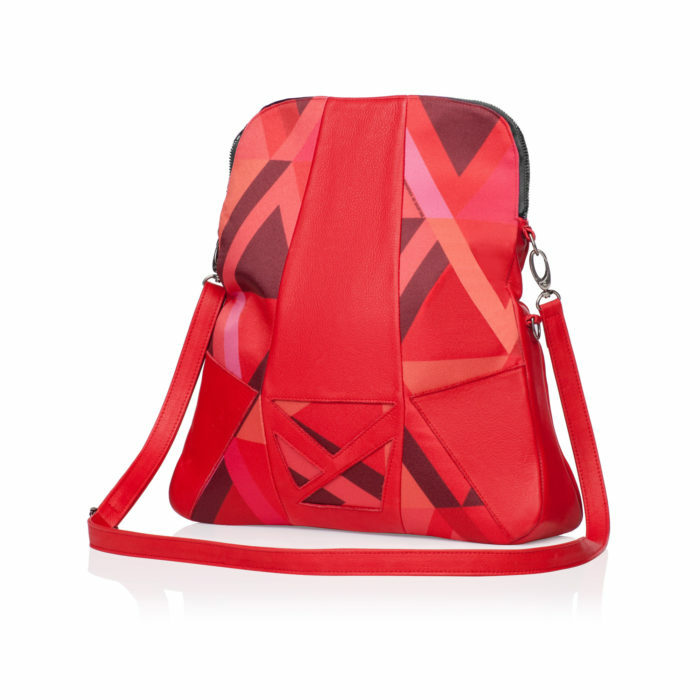 Comprised of printed fabric highlighted by leather trim, this is a classic handbag with an unmistakably modern twist. Not only is HEATHER a conversation starter, it is also lightweight and deceptively spacious while maintaining elegant proportions. The HEATHER handbag is worn snuggly and confidently against your body, letting you know you’ve got everything you need for the day by your side. Additional features like a key ring clip, a large zipper pocket, and a pair of open accessory pockets make HEATHER as practical as it is attractive, and its magnetic snap will ensure your belongings remain secure. 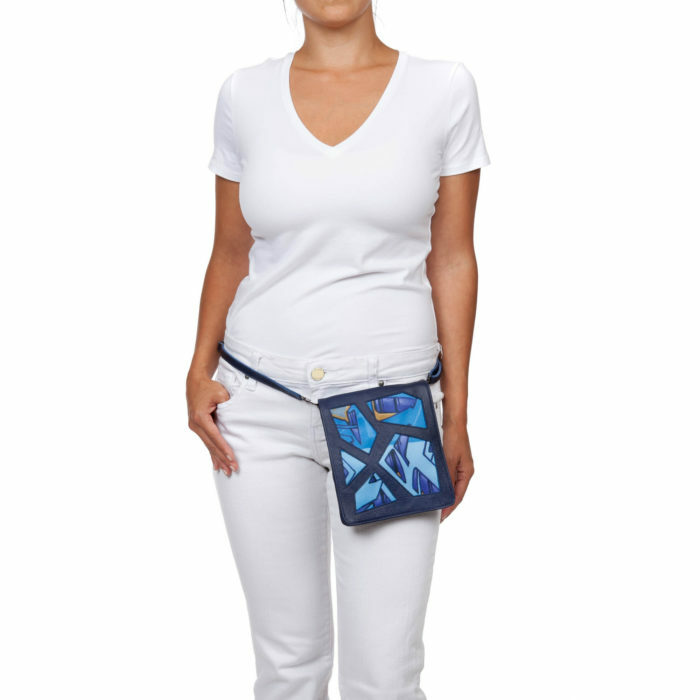 A stylish way to carry all the essentials over your shoulder, in your hand, or hands free around your waist, the small, compact, and lightweight DENISE waist bag measures just 6.5 inches by 7.5 inches and weighs less than nine ounces. With three compartments and a zipper pocket, DENISE carries your wallet, phone, and keys with ease, making it suited for everything from a night on the town to a quick trip to the grocery store; from walking the dog, to dancing at a music festival, to running after the little ones. Like most JoJo Handbags products, DENISE is also multifunctional: remove the strap to convert it to a clutch or wear it around your waist or over the shoulder for more casual outings. 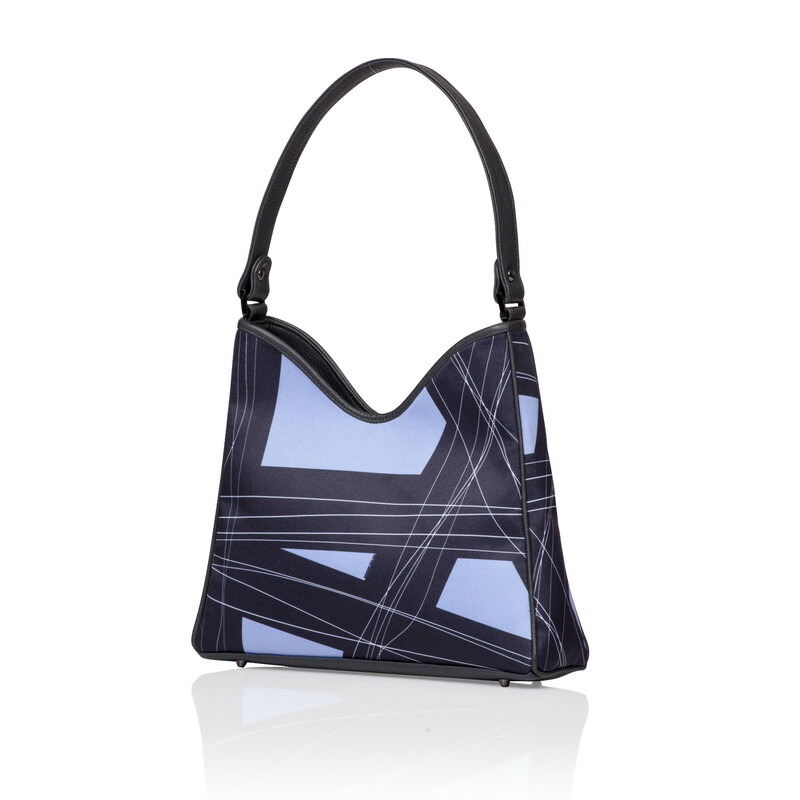 HANNAH is available in blue, purple, and grey, and features bright, bold patterns in each design. 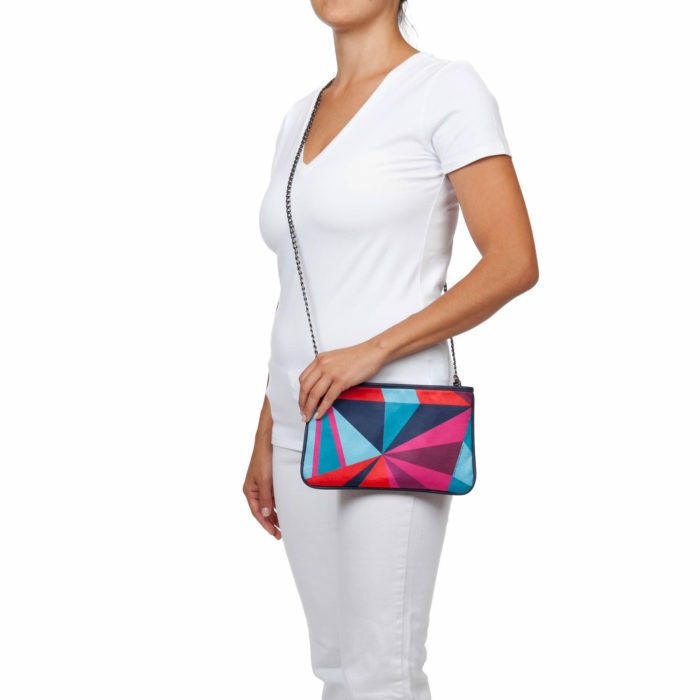 With colorful leather accents, HANNAH can be dressed up as a clutch or worn as a unique crossbody bag with its classy gunmetal chain. One of the more versatile styling pieces in the JoJo Handbags collection, HANNAH looks amazing with jeans, dresses, or even leggings. Even though HANNAH is sleek and trim, she still contains a leather lined divider, a zipper pocket adorned with a customer purple, gray, or silver zipper, and a hidden magnetic closure. BECCA is the most versatile piece available from JoJo Handbags: it can be worn as a messenger bag, one of two types of stylish handbags, or as a practical, easy-to-carry backpack, and two hidden outside accessory pockets let you keep essentials like your cell phone and sunglasses handy. Whether you’re heading to the office with your laptop or to the beach with some picnic supplies, this bag is ready to keep up. With three open accessory pockets and a strong yet smooth zipper closure, BECCA is truly a go-anywhere bag and the perfect travel companion for wherever your next adventure takes you. The best way to purchase a JoJo Handbag is at JoJoHandbags.com! Browse the full line and add the bags that catch your eye to your shopping cart, which you can view and edit at any point in the purchasing process. When you’re ready to check out, submit your billing, shipping, and credit card information and click “place order” to finalize your purchase. You’ll be sent a confirmation email when the order is processed successfully. Return customers may want to set up an online account to further simplify the purchasing process. Creating an account is fast and easy, and will allow you to shop and check out without delay. JoJo Handbags will securely store your shipping and billing address to make future site visits and purchases a breeze. JoJo Handbags happily accepts all major credit cards, including American Express, Visa, Mastercard, and Discovery, as well as cashier checks and money orders. All orders shipped within California will be subject to 7.25% State Sales Tax and orders shipped within San Diego County are subject to 7.75% Sales Tax. Customers are responsible for district tax remittance if applicable. Customers purchasing goods in all States outside of California are responsible for complying with local state tax laws. Not all matches are made in heaven, which is why JoJo Handbags accepts returns within 15 days of receipt of the product. Contact the company directly via email or through its contact page. JoJo Handbags are available for sale in boutiques and shops. Visit the wholesale page and fill out a contact form today to learn more, or contact sales@jojohandbags.com directly. Subscribe and get 15% off your next purchase!